December 6th, 2013 | 5-9PM | One Night Only! 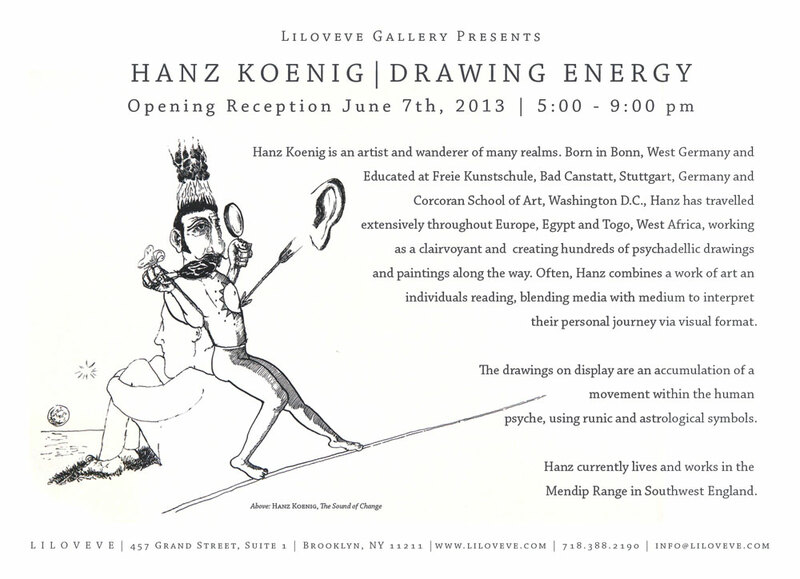 Hanz Koenig: Drawing Energy opening at Liloveve Gallery in Williamsburg, Brooklyn on June 7th from 5-9 pm. Liloveve Gallery in Williamsburg, Brooklyn presents “Drawing Energy”, an exhibition of recent works by illustrator Hanz Koenig. Encompassing the artist’s illustrations from 2000-2006, this solo exhibition reveals Koenig to be a philosopher of art, culture, and spirituality. In this particular body of work, Hanz explores the depths of the human psyche through runic and astrological symbols, offering compelling meditations on the the human spirit. Drawing on his years working as a clairvoyant in various parts of the world, Hanz uses his interactions with others as inspiration for his work. Often he creates pieces based on the prophetic readings of others, generating imagery that interprets their personal journey through visual form. We invite you to immerse yourself in Hanz’s world for a night- to surround yourself with the celestial and otherworldy. Come experience the strange and psychedelic and awaken your inner self through the meticulous and hallucinatory drawings of a modern oracle. Hanz Koenig was born in Bonn, West Germany in 1965 and educated at Freie Kunstschule in Stuggart, Germany and Corcoran School of Art in Washington D.C. He has traveled extensively throughout Europe, Egypt and West Africa working as a clairvoyant and visual artist. He currently lives and works in the Mendip range in Southwest England. 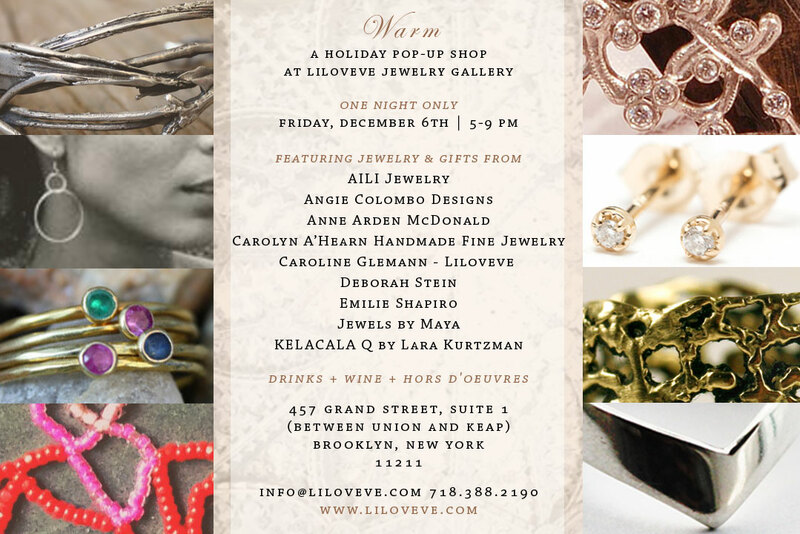 For more information, please contact the gallery at 718.388.2190 or info@liloveve.com. Hanz Koenig: The Sound of Change – one of the many works on view at Liloveve Gallery in South Williamsburg. 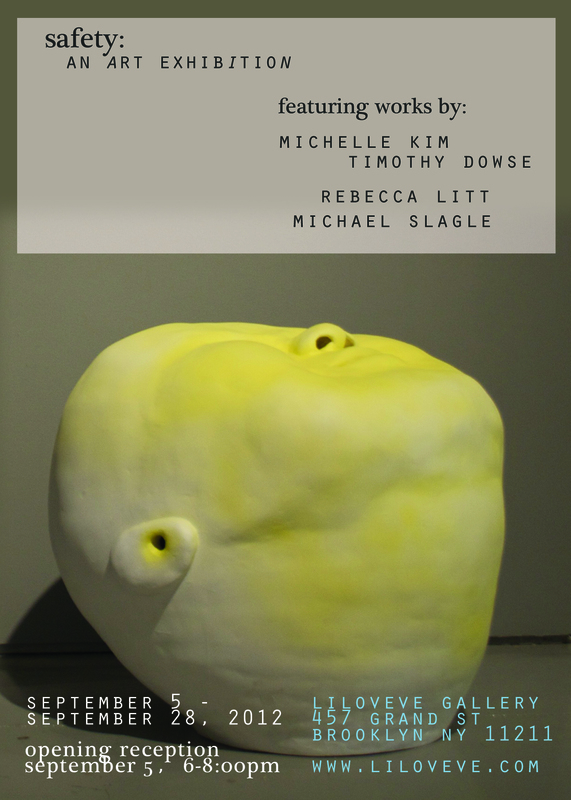 Please join us for an artist reception in honor of Rebecca Litt, Michael Slagle, Michelle Kim, and Timothy Dowse.Burnside Brooklyn is hosting an after party for guests of SAFETY. After the opening, please enjoy a cocktail down the street at 506 Grand Street.SAFETY is open to the public Friday through Sunday 12:00 to 6:00pm and by appointment on Tuesday through Thursday. The exhibition will close on Friday, September 28, 2012.On Friday, September 14th, LiloVeve Gallery will stay open later to participate in the WGA’s Williamsburg Every 2:ND Friday Gallery Crawl. For more information, please visit http://every2nd.org/.